I'm a Montana girl and there's nothing better to me than summertime in my home state. For me, no visit is complete without spending time in the "Crown of the Continent", Glacier National Park, and since I've been more times than I can count, this year I decided to see the park from a new vantage point... on horseback! 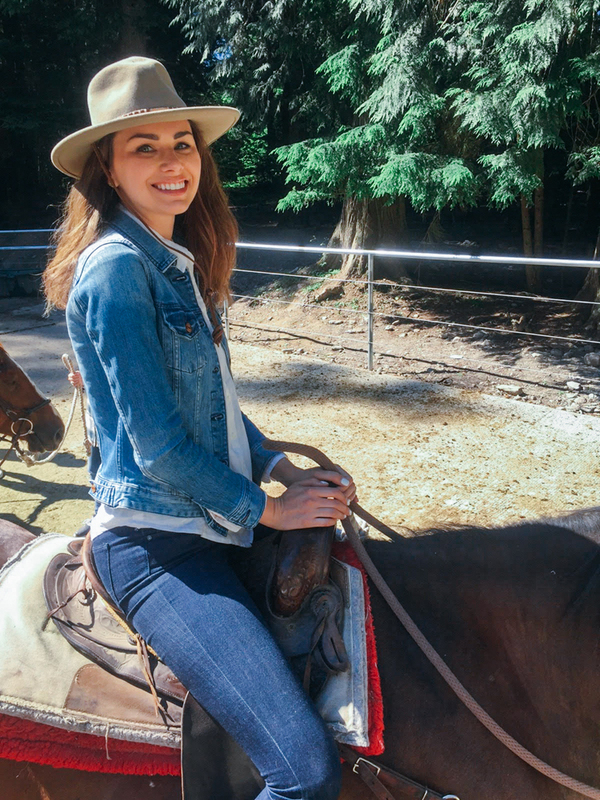 Prior to my trip in July, I had been researching activities in the area and stumbled across Swan Mountain Outfitters, the only company who provide horseback rides inside Glacier, and booked a two-hour trail ride for my family. We woke up early on a Thursday morning and drove the 40 miles to the west side of the park, where our adventure would begin at 10am. I prefer the west side of the park to the east side, as it offers a great mix of sightseeing opportunities, so out of the dozen or more trail options, I chose the "Upper McDonald Creek" two-hour ride which starts and ends at Lake McDonald Lodge, a Swiss chalet-style historic lodge set in the most picturesque location. 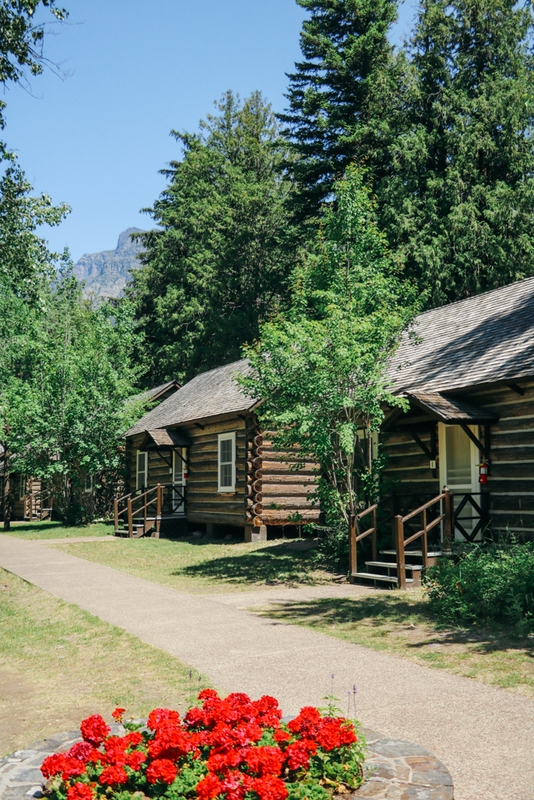 It's one of the few accomodation options in Glacier and makes for a great home-base during any visit. The majority of our trail ride took us through a dense Cedar Forest, with the highlight being incredible views of both the upper portion of McDonald Creek and Lake McDonald. The aquamarine glacier water set against mountain peaks was truly stunning and to see it from this new vantage point was something I'll never forget! 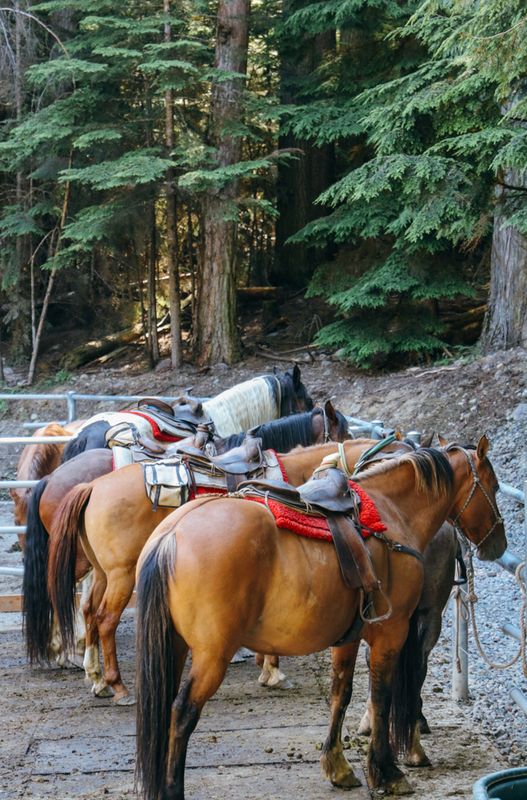 This trail was great for us beginners, as the horses were extremely well-trained, rarely veering off-course, and the outfitters in-control, which allowed us to sit-back, relax and soak-up the peaceful surroundings. Even though horseback riding is a way of life in Montana, this was actually my first experience, and I'd highly recommend it! However, if you're experiencing Glacier for the first time and only have a day or two in the park, I'd suggest keeping your ride under two hours. Aside from a full-day excursion, I don't think the longer rides offer enough change in scenery to make it worth it. Two hours will give you the experience while still allowing plenty of time to explore the rest of the park by hiking, mountain biking or camping. Plus, it's not the most comfortable thing you'll ever do! After our ride was over we were quite hungry so had a quick lunch at Lake McDonald Lodge before making the journey up Going-To-The-Sun Road, a quintessential part of any Glacier visit and a scenic drive that will leave you speechless and in awe. If you're experiencing Logan Pass for the first time, I recommend taking a Red Jammer to the top, as so much of the park's scenery is vertically oriented and the roll-back tops are perfect for providing full views of the mountains and wildlife! I wore long layers for the day, as Glacier is typically 10-15 degrees cooler than the surrounding area, and even in the dead of summer can be quite chilly, especially the higher you climb. Remember, it's called "Glacier" for a reason! It was a great excuse to wear a western style hat and my lightweight canvas backpack was the perfect bag for all my necessities for the day. It was a great day all around!